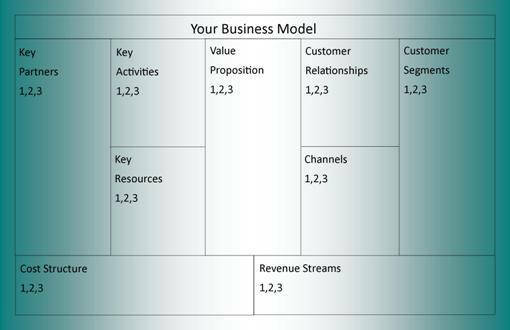 What business model attributes can you add for business advantage? See a list of business and technology atrtributes with definitions. Internal corporate customer The customers can be other departments within a larger organisation. All departments can help support the company strategic goals. Online members This can include Facebook Page likes, LinkedIn connections, LinkedIn groups, Twitter followers, Google + connections, email marketing members etc. Online Buyer Digital and Physical products and services. e.g. Digital download of music or CD by mail purchase. eBay / Amazon /Shopify etc market sales Sell on multiple channels including Internationally. You might use Fulfillment by Amazon warehouses around the world. Market Segment Niche, Retail Store, National Wholesale, Industry Sector, Mass Market, International Retail, International Wholesale, Business to Business sector. Help with customer jobs Save customers time and / or money completing their jobs. Reduce customer pain Help customers avoid pain points and reduce risks. Help with Customer gains Help customers gain with your solutions. e.g. Save money or make more money. Digital delivery Digital products can be delivered for free using the Internet. See also 3rd party logistics. SMS reminders Send scheduled SMS reminders for upcoming appointment. FAQ online Frequently asked questions can be answered in a web page. Improve customer satisfaction. Online queries Have the means to answer question via a web page form or social media interaction. 3D printing to order 3D printers can print plastic parts up to about 15 x 15 x 15 cm. Useful for prototypes or custom products. Online appointment bookings Allow customers to book an appointment via your website. Appointments can now be made 24/7. Email Marketing Email List segment for customers/buyers. Build lifetime trust and value emails. Offer emails for complimentary products, maintenance, services etc. In store QR codes for more info. Quick Response code symbol can be placed near products. User can scan QR code with smartphone and link to more information. Loyalty card with analytics Analytics can identify customer insights, buying patterns and create custom marketing. Customer website interactions Allow customers to view products in different ways such as how to use video, custom ordering online, calculators for requirements etc. Social media interactions Follow multiple social media platforms together while tracking your industry keywords. Respond to enquiries and attract new customers. Email Marketing Online advertising -> Landing Web Page -> Opt-In Form -> trade email for Lead Magnet -> email sequence with offers. Digital white paper Longer electronic document describing how to use products, benefits to using products, new ways to use products etc. Include links back to website. Company app Application can be used as a new channel for customer interaction with your business. Consider customer interaction via smartphones or tablets. Internet text search Create good web pages that include your services, industry keywords and location. Search engines can bring customer traffic via the keywords you used. Internet image search Images used on you website can include ALT descriptions. Search engines can use the descriptions to allow customer to come to you via the images. Internet map search Register your business location via the search engines. e.g. Google Places. Your business will appear on map searches with link back to your website. Pay per click PPC PPC are text, image or video ads run on search engines and affiliate sites that link to your website. New customers can get to your website for under $1 each. Web page product awareness A web page descibing a problem or need and the solution. This can be the first stage of customer acquisition. Web page product evaluation A web page comparing various solutions include why your solution is most suitable. This can be the second stage of customer acquisition. Web page product purchase A web page that includes the buy button or call to action. The could include becoming a online member or email marketing client etc. Information computer kiosk Allow navigation of your website from inside the store. This can also include touchscreen interface from the front window. e.g. Real Estate with more pictures. Smart digital signage Large screen that can be controlled using a computer network. Showcase products visually with a schedule or provide customer product education etc. Customer feedback system Allow for customer feedback via SMS, email, web page form etc. Learn insights on how to improve your customer service, new product ideas, new product uses etc. 3rd party logistics Outsource the product wholesale delivery, product warehousing, product shipment to customers. Your interaction with products is now only digital. Can be international. Order delivery systems Smart systems for customer ordering, payments, shipping labels, packing slips, logistics, customer updates and customer feedback etc. Automation systems Computer systems can be used for some repeatitive tasks. E.g. Automated product testing, If Then Do This systems, Workflows with accounting links etc. Decision support systems A digital rules and facts system to help make decisions. This can come in the form a system status dashboards with pre calculated suggestions. Can be used for stocking levels and product turns. Website analytics Keep track on website traffic sources, traffic volumes, search keywords used, time on website, time on webpages, website links chosen etc. See results over any date range. Industry analytics Track trends within your industry and respond accordingly. Knowledge bases Build up information in a easy to access system. e.g. Wiki. Can be used for best procedures, fault finding, work instrutions, business performance trends etc. Mentors and Gurus Listen to new posible views on busines operations, business models, technology advancements, more efficient proceses etc. Tech. maintenance provider Include processes to maintain close to 100% uptime for equipment with redundancy options if required. Help prevent risks my using active monitoring systems. Tech. innovation provider Examine a business versus possible best practices. Create business plans for the most worthwhile changes. Implement the changes as a managed project. Cloud email provider Host email services on a cloud based system instead of a local server. Access email from multiple computers, tablets and smartphones etc. Cloud virtual servers Run a virtual server/s from a data centre. Save on space, cooling and electricity. Can be used for development, disaster recovery and remote backup. Cloud operating systems Run virtual machines from a data centre with operating system and server software already present. Auto updated. Cloud software providers Run software from cloud providers with a subscription model usually based on users per month. Pay only as you need. Auto updated. Digital service providers Provide remote digital services. E.g. Convert media types as a queue process, remote online accounting, virtual server monitoring, website performance review. Remote VOIP telephony Run telephony from one or multiple offices without a PABX. VOIP handsets and powered networking ports are all that is required onsite. PABX is remote and managed for multiple clients. Virtual assistants Allow for distributed virtual teams to work together. Acquire skills from around the globe if required. Work across time zones if required. Digital analytic providers Provide data on website performance, business performance analysis, global sales analysis, competition analysis, search keyword trends etc. Serviced virtual office Provide telephony, receptionist, mailing address, meeting room as needed. Scale up requirements as required without long term leases. Quick to set up in new cities. IT remote support providers Remotely track the performance of IT equipment including backups, drive space, patches, anti virus, network load, event log monitoring, application status etc. Web hosting Provide server facilities to maintain your website. This can also include email addresses, databases, private static IP address and domain names. Email marketing Provide online facilities to generate emails to be sent to groups of email addresses with reporting. You can also create a scheduled automatic sequence of emails for new subscribers. Content creation Create content to suit your customer needs with the keywords they use. Include on page optimisation techniques to be correctly indexed by search engines. Pay per click ads New customers can get to your website for under $1 each. You set a daily budget limit and only pay for ads that are clicked on. Once started its automatic. Digital products as a service Source online teaching courses, online audio visual editing, content creation, graphic design, online conference events and paid webinars etc. Photos, video, audio, illustrations Buy or create audio visual content for marketing, website content, product information guides etc. Application creation / maintenance Create and maintain applications for desktop, smartphone or tablet users. Adjust application for modern hardware such as high resolution screens. Cloud services pay as you go / need Cloud services can be bought as needed. e.g. x$ per month per user. Scale up and down as required. Test applications with minimum cost risks. Renewable energy creation Compare if alternative enery sources are cheaper than conventional providers. e.g. Solar power and cogeneration gas. This could be a competitive advantage or income if feed back into the grid. Digital products Sell products such as reports, eBooks, software, audio, video, photos, illustrations online. This can be done directly or via a provider like iStockPhoto, Force.com or Amazon.com. Affiliate commisions Traffic from your website to affiliate links to complementary products can earn commision. App sales / in app purchases Create software for smartphones and tablets with income from direct sales, in app purchases and affiliate links. Online sales Sell products directly from your own website. Payment buttons or checkout can accept multiple payment types. Online service provisioning Create a website that performs a business process for others. E.g. Online project management, online teaching system framework, business template for website operations. Online membership subscription Create content with paid membership access. e.g. Online newspapers, niche industry associations, music access subscription, training programs, special diet programs etc.